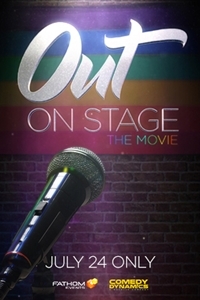 Fathom Events and Comedy Dynamics bring the premiere of OUT on Stage to movie theaters on Tuesday, July 24! OUT On Stage is THE absolutely hilarious and one-of-a-kind, originally produced comedy hosted by Zach Noe Towers - OUT Magazine's "One of the 10 comedians to watch in 2018," the comedian that Sarah Silverman calls, "So, SO, SO Funny" and the current host of The Elite Daily Show on Verizon's Go90 Network! Experience the party when Zach and 16 other top-rated Gay and Lesbian stand-up comedians discuss taboo subjects as only they can! Featuring Jonathan Rowell, A.B. Cassidy, Casey Ley, Julian Michael, Chris Bryant, Eric Hahn, Janine Brito, Jared Goldstein, Kyle Shire, and more!